Clean, and it passes the sniff test. He looks like a model here, doesn't he? And, I don't mean that in a good way, I mean in that very posed way; he's making me think of one of those black and white shots from a sweater book from the 80's, one of the Rowan theme issues, perhaps. Actually, he was watching the cat play and about to start laughing. 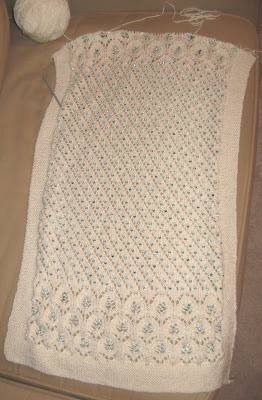 Once again, I highly recommend this pattern, it's fun and fast (just under 1 month this time). Back to Frost Flowers - if Indy will let me. Hope everyone's holiday plans are shaping up. 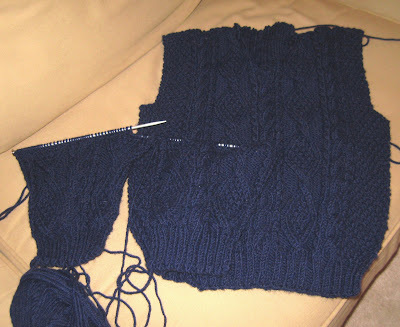 I've sewn together the front and back, and am a third done with the sleeves and this little sweater seems to be taking FOREVER. But everything seems to be taking forever lately. Maybe I'm just tired and can't wait for winter break. Oh, and here's Indy pretending he's a pirate's parrot. Argh, me hearties! Indy, the cutest (farting-est, don't know if I've mentioned that - how can something so small and cute make such horrible smells? I suspect he'll grow out of it and doesn't seem to be in any kind of discomfort, but I'll ask the vet when he goes for his follow up shots), most human-centric kitten of all time continues to slow down my knitting to a crawl. I'm glad I wasn't working on a present list this year. 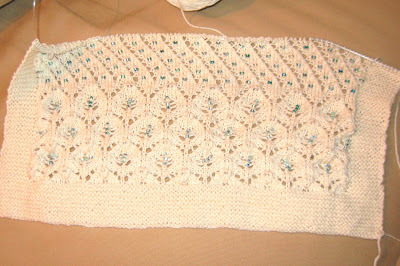 I have too many things on needles right now so any progress on anything is minuscule. 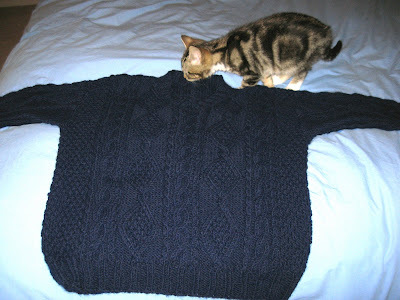 I'm having a strong urge to start another Jack's Back - but here's my problem (aside from the fact there's no room in the knitting basket) I really want to do a red and brown version, but I have loads of blues and purples in the bins of yarn. I'm sort of teetering on the brink of starting another, very involved, knitting project but if I make myself do the right thing re: my stash, I might flame out and end up with another slumbering mess. And spinning? I haven't had the guts to try it since Indy came to live with us. I've had a suggestion that I get a video of that. No pictures at this time, but . . .
Peacock - teal and blue yarn with purple, green and gold beads using a more round, eye-shaped lace motif - maybe do the center as a semi-circle that continues out along the wings of the wrap so you look like a peacock from the front? 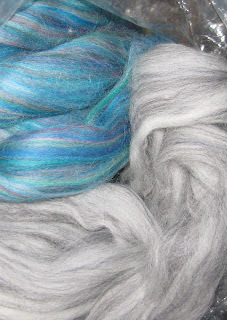 Maybe do that semi circular in just blues and greens, more like a real bird? 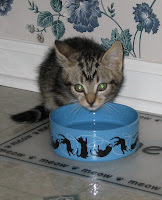 Man, kittens get big fast! Indy is probably doubled in size since coming home 9 days ago. Here's Nanna - and here's Indy attacking it. And here's out Christmas tree, which he did NOT pull down on himself today while home alone with the tree. We're proud of that. Oh, and we have a pretty great tree stand. That would be Indy titling my post for me, tiny kitty feet on the number pad. 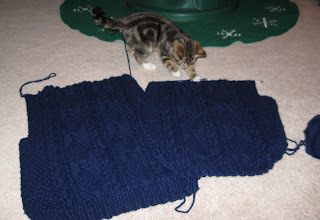 I'm more than half through with Nanna, but knitting with a little kitten playing with your yarn slows things down. Maybe I'll get my act together and take snap tomorrow. Right life is just in the general holiday haze. 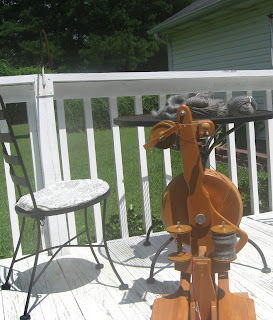 There's nothing to put a crimp in your knitting and spinning like a brand new kitten. Meet Indy (as in Indiana Jones) - 8 weeks, 2 lb. He already loves to play with knitting needles and yarn as you work. Saw a lot of this stuff this weekend while biking. The south seems to have more than it's fair share of pretty purple wildflowers (unlike Kudzu, Ironweed doesn't seem to have a scent). Sort of looks like the purple fall flower I'm used to from NH - purple asters. Still, it's another thing kicking around in my head for a fall project - maybe a fair isle, maybe something with texture or cables and color? I now know how to disassemble and fix a very jammed heavy duty stapler. 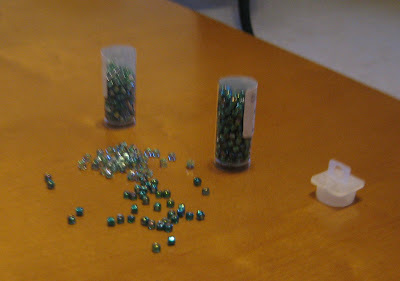 I have a much clearer understanding of how to cut, shape and use 1/2 inch galvanized construction fabric. I now know that I can staple said fabric into rafters with said stapler above my head and behind me while lying on my back on a one inch beam and balancing myself so I don't fall down into my own kitchen. I know this last one isn't a lot of fun and the insulation makes me cough. I know my attic reaches 90-plus degrees by 10am. I know I need more 1/2 inch galvanized construction fabric to finish this job. I also know I don't want squirrels in my attic. Sigh. So I'll do something else with my afternoon. 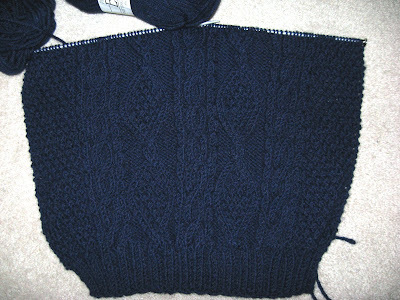 I'm almost done with the Gotland. 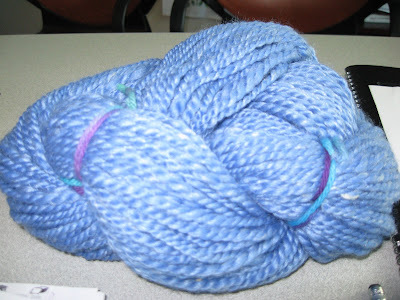 I need to measure these skeins, they must be HUGE. Have a nice day, everyone. My car went to the shop today (nothing big, in fact so minor the fix was free) so I had an unexpected day at home. And I learned some things. I now know how to disassemble and fix a jammed heavy duty stapler. That's not really true, but I've got too much going at once to make much progress. 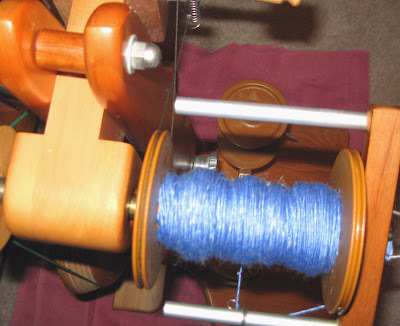 I'm still happily spinning on the Gotland, but it's a bit slow - I can spin nice and small, which means filling up a bobbin takes a long time, so I only have 2 skeins plied. I'm over half through it, but I've already posted pictures. But I still love the smell and the feel of this fleece. 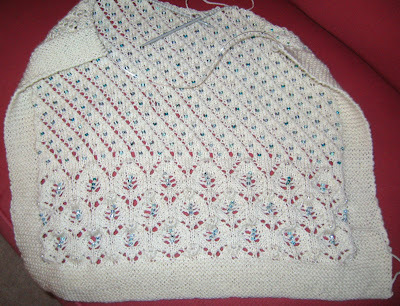 I've been mulling over pullover ideas for it once it's done. It's very slick and heavy for the gauge, so I think less would be more, patternwise. 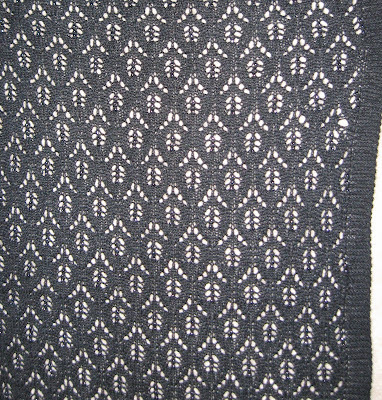 I'm also working on linen stitch, and the Iron Matrix shawl. 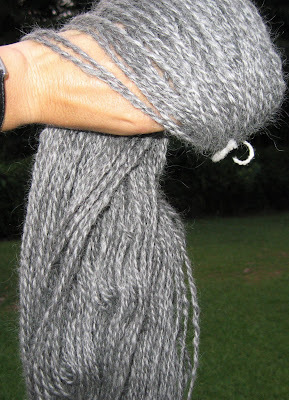 I'm into the second skein of Gloss. 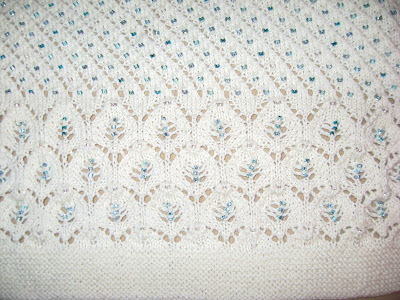 Knitpicks' latest catalog has the twinset from the Natural Knitter worked up in Gloss, and it looks lovely. 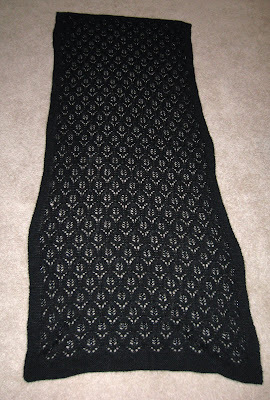 I had a mental note to try the cardigan from that pattern, and I think Gloss would be great. Lots of nice new colors as well. 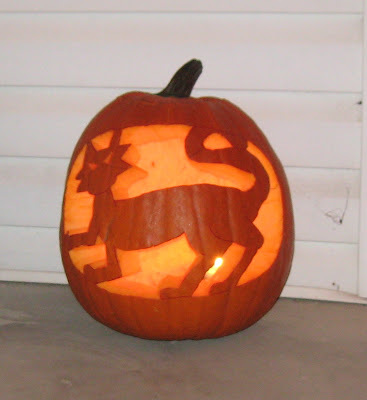 Pumpkin appeals to me - maybe it's wistfulness for fall in New England, 'cause I sure don't look good in orange. 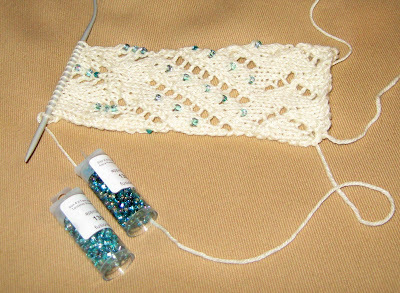 I'm still kicking around the white beaded Matrix version - maybe try the pattern in a big triangle, maybe only do the beads on the outside edge to keep the weight done? 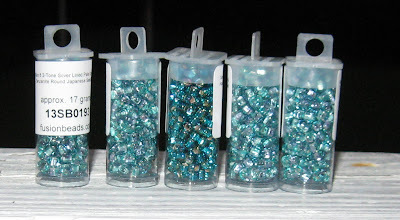 I still haven't found size 6 beads that I think would work . 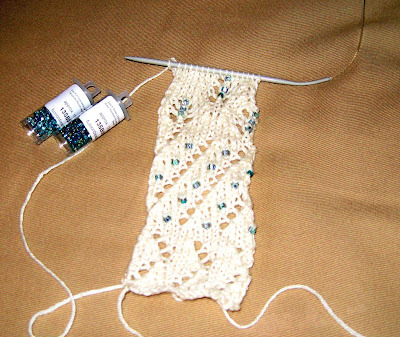 . .
And the linen stitch is coming along, I'm alomst up to adding on for the sleeves and I predict that one will slow WAAAAAYYY down when that happens. Maybe I can wear it in the spring. 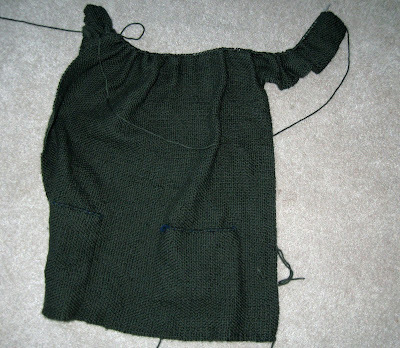 The linen stitch top is going well, if not exactly exciting to look at. Or photograph. 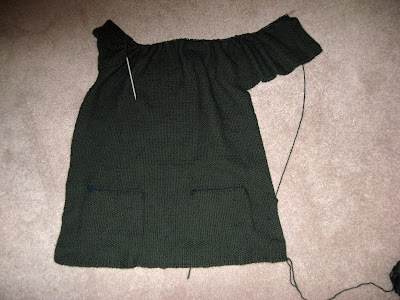 Sorry, once the sleeves go on it will begin to more interesting. I'm really interested to see if the linen stitch does anything to ameliorate the pilling that happens to most cotton yarn when washed. 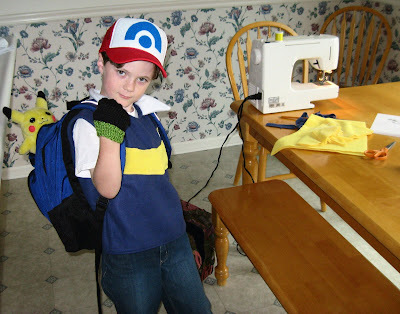 Guess I could have done a swatch and tested it. 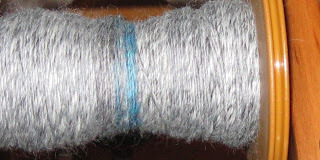 And here's the Gotland plied up. It's shiny and kind of hard, not as hairy as the singles were, and it's HEAVY. 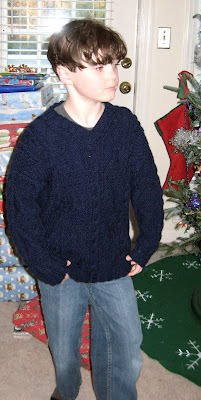 It would work best knit into a very plain sweater, I think, otherwise it would be a workout to wear it. 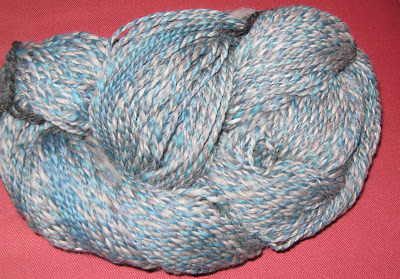 But it does spin up nice and evenly, so it wins as the most evenly plied yarn I've ever made. And it smells very sheep-y. Which makes me happy.